A million dollar rain? I’m not sure but it certainly was great to finally get something substantial, we had gone for over a month with only one tenth of an inch and were beginning to make alternative plans for the fall crops. The 90 day forecast is for normal temperatures and rain, lets hope they are right. These last few days have been sublime with the cool nights and clear days, almost like fall. With that inch and a half of rain we can now start the process of getting cover crops in the ground. When it gets as dry as it was it is impossible to “cut ground” as the old timers say. Yesterday as I headed into town to deliver I noticed several farmers out disking their fields, turning under the residues of wheat or something else and drilling in soybeans or sudangrass. So the same will occur here, except it will be the overwintered flowers and other spring crops just now finished. Hopefully we will continue to get some good rains to bring up thick soil improving crops of cowpeas and sudangrass or soybeans and millet. These crops will grow to eight feet high in eight weeks giving us thousands of pounds of organic matter to return to the soil along with over a hundred pounds of free nitrogen fixed by the bean crops to feed the next cash crops. They will provide habitat for good bugs that will help us fight the bad bugs. They will shade out summer weeds and give shade to the turkeys when we move them into those fields. If the rains come. 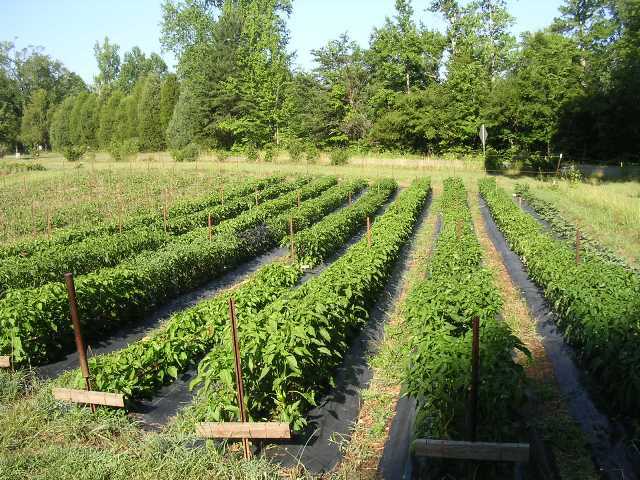 A fairly normal week here on the farm, the staff is getting into the easy pattern of tomato picking Mondays and Thursdays, weeding a little, seeding new crops for the fall and winter, and continuing to trellis the summer crops. The last planting of Sungold cherry tomatoes went in the ground yesterday, timed to be ready in late August and to carry us to the end of the season. It has been interesting to watch the salmonella tainted tomato story unfold over the last few weeks and of course we are humored by that fact that they can’t seem to trace it back to where is came from or even if it was tomatoes at all. To all of us local produce farmers it is just another supporting argument for local small scale agriculture. If you know your farmer and where your produce comes from it you can be more assured it won’t come with bad things attached. Now I am not saying that it can’t happen but the reality is that most small growers don’t have the volume to need produce washing lines which is where most of these health problems start. When you dump thousands of pounds of tomatoes into a big tank and slosh them around it makes it much easier for the few tomatoes that might have had contact with something unhealthy to pass it onto the rest. Most of us don’t wash our tomatoes at all. Because we don’t spray anything bad on our tomato plants we are able to just wipe them with towels to clean them up and pack them straight into the boxes for market. Nothing like a good local tomato.